ZAAFARANA (Syria) (Sputnik) – Depots with weapons produced in NATO member-states as well as underground explosive production facilities are being found by members of the Russian Center for Syrian reconciliation and Syrian government troops in the territories liberated from militant groups, the center said on Monday in a statement. According to the statement, the officers are also revealing underground tunnels that are equipped with medical complexes as well as detention facilities for civilians. Syrian sappers continue to de-mine settlements in the liberated areas. “We are in the Zaafarana settlement in the province of Homs at an al-Nusra Front terror group [also known as Jabhat Fatah al Sham, outlawed in Russia] observation point. We can see here a large number of gas masks, weapons produced abroad, for example, TOW-2 anti-tank guided missiles. The facilities are very well-equipped,” the center’s representative Andrey Nekipelov said. Previously, the Syrian government forces have repeatedly announced they found militants' weapons, which had been produced in NATO member states, as well as Israel. While the information hasn't been neither confirmed, nor denied by the alliance's members, the US alongside some of its EU allies, have been supporting what they described as the "moderate Syrian opposition" since the beginning of the 2011 civil war. Despite the fact that the Western states were providing training and military equipment exclusively to the Syrian "rebels," the weaponry was often later found in the hands of Daesh* and al-Nusra Front* terrorist groups, according to media reports and Pentagon officials. Russia, alongside Iran and Turkey, is a guarantor of the ceasefire regime in Syria. 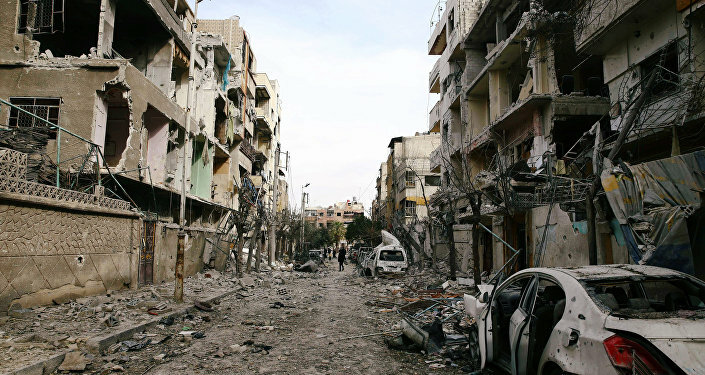 Moscow has also been assisting Damascus by supporting the struggle against the various terrorist groups and by providing humanitarian aid to residents of the crisis-torn country.